The Restore Inner West Line Community Action Group (RIWLCAG), which organised the protest, believes “every major transport issue in the [Inner West] area can be fixed by restoring the Inner West Line train to Liverpool (and Bankstown) via Regents Park”. RIWLCAG also argues the proposed Sydenham-Bankstown Metro will affect thousands of commuters who will no longer be able to get direct trains to the city from nine stations west of Bankstown. In an open letter to state government MPs, RIWLCAG wrote: "Since November 2013, our direct connection to the city via Lidcombe has been cut and now you are proposing to block our direct train via Bankstown. “Privatisation of public transport in Melbourne and Newcastle has been a disaster for commuters." 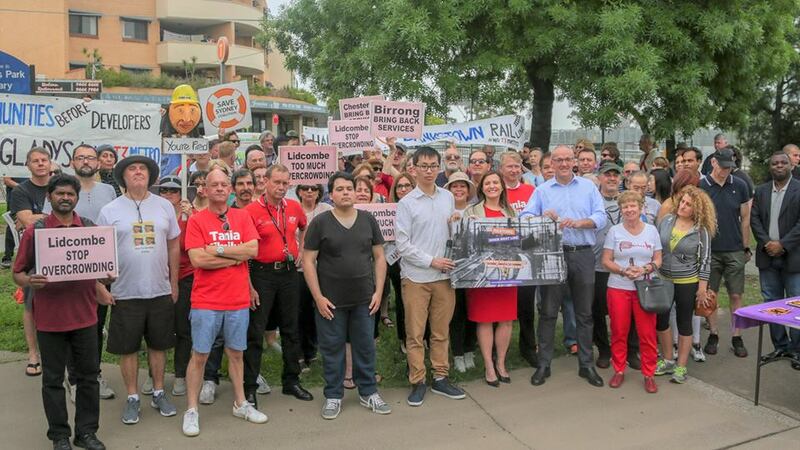 Addressing the rally, Labor opposition leader Luke Foley pledged to reverse the Coalition government's plan to pull up the Bankstown rail line and restore rail services to Sydney's West to 2013 levels. Foley also said that a Labor government would refund fares to commuters if their public transport service was more than 30 minutes late.